Move over clunky, dry Art History 101 text book, there’s a new contender for your shelf space. 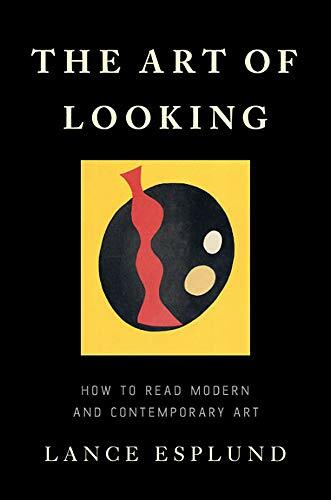 The Art of Looking: How to Read Modern and Contemporary Art is a learner-friendly, condensed edition of the complex and convoluted world of art-making over the past 100 years. Esplund, an artist, historian, critic and professor, is dedicated to teaching people how to see a piece of art, not as someone tells them they should, but as they are intuitively moved to think, feel, and experience. In art, as in life, each participant is an autonomous individual and as such must have an autonomous interaction with the art they encounter. There isn’t much mystery in appreciating art. All that’s needed is the confidence that the viewer’s perspective matters. Yes, there are volumes upon volumes written about art history, art critiques, art theories, art philosophies, art, art, art, art, art. But when all is said and done, all of that information is just going to echo around inside a brain that cannot, or is unwilling, to think for itself. In the first section (Fundamentals) of The Art of Looking, Esplund helps the reader discover a way of looking at an artwork in order to make it more personal, more grounded, more relatable—and to stop the brain from rattling. The language of art has not changed. Color, line, form, ground, tension, metaphor, etc., are all the vocabulary of artists no matter the century, location, or medium. Each generation of artists has focused on one over the other, on certain subject matter, on certain ideologies, but the basic building blocks have not changed. “Art,” says Esplund, “is a language unto itself —a language that exists beyond its particular era. That language continually evolves and reinvents itself— even often quotes itself.” In this sense Modern artists are no different from artists in any other era. Modernism was just another philosophical reaction to the dominant position of art in the early 1900s. It developed in the midst of the Industrial Revolution, political turmoil, and a dissatisfaction with the current art establishment. In the prolonged conversation of art, there is always a comment and a reaction, a point and a counterpoint, a shock and an acceptance. Modernism reacted, and then contributed another point of view. Contemporary artists continue to work in this fashion, responding to the wealth of collective artistic thought. Because the writing style is encouraging, intelligent, and thought-provoking the reader will find themselves annotating the margins, making connections, and absorbing the art critic spirit of analysis. Once one has had an aha moment with one piece of art, they will automatically find deeper understandings of all art, past and present, and will find themselves opened up to a new world. A world where they will relate better to art, artists, other people, their community, and more importantly to themselves. With foundational bearings established, the second section (Close Encounters), brings in ten artists who demonstrate the aforementioned artistic principles. These examples include the traditional mediums of paint and sculpture such as Joan Mitchell (1925–1992), Jean Arp (1886–1966), Paul Klee (1879–1940), and Richard Serra (b. 1938). Video, performance, and light artists are also discussed. Elaborating piece by piece, the reader begins to realize that galleries are not intimidating spaces, but community bulletin boards promoting personality and vision. Esplund entreats people to slow down and spend more than 15 seconds glancing at a masterpiece before writing it off as incomprehensible. Connecting with art requires an investment. The Art of Looking explains in layperson’s vernacular why investing oneself in art history matters at both a personal level and to the community at large.